Home » Features » NCISLA Secret Agent Man – From Detective to Agent? NCISLA Secret Agent Man – From Detective to Agent? While our favorite leading man will likely not take the official leap from LAPD Detective to NCIS Agent anytime soon, now is as good a time as any to consider 1) why he hasn’t yet made the commitment and 2) what could move him in that direction in the future? Before looking ahead, let’s look back to see how he came to join our motley crew. So what do we know? He initially worked in the law profession. While Deeks’ traumatic childhood would be an obvious prompt to join a “helping” profession, this particular choice takes considerable time and effort. Is there a deep and serious persona under our jokester’s façade? I think we would all proclaim, “Yes!” and look forward to our own investigation of this entering Season 6. 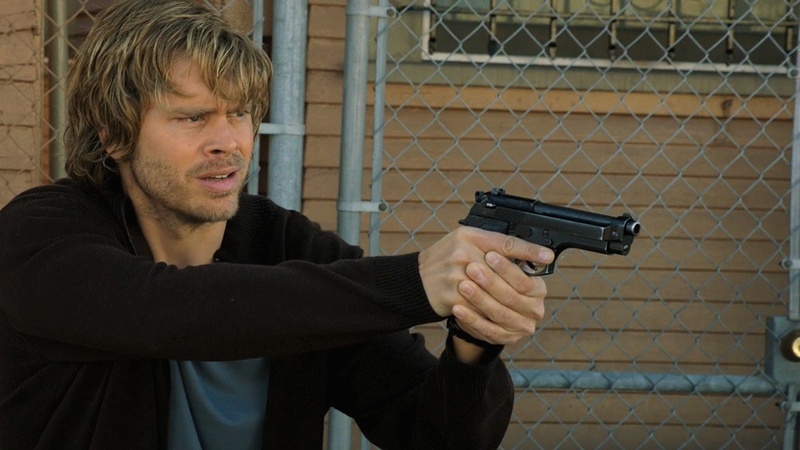 The role as a public defender is a perfect fit for Deeks, again based on what little we know about his formative years. What Deeks was actually like as a lawyer and what his specialty would have been are big enough topics for an entirely separate article here at wikiDeeks! Hetty recruited him. As with anything even remotely related to our ninja leader, we know virtually nothing and are left with a teapot-full of questions! He’s choosing to remain a cop and not officially join NCIS (at least for now). There will be at least one significant reason behind this purposeful decision. In the beginning, it made sense to stay a cop, as it was what he knew and what he was good at. Now, in seeing his personal and varied “’ships” with other members of the team, realizing he’s physically safer with them and NCIS support, and knowing he can participate in advanced (cool) training, this is an issue begging for insight. Why the change from lawyer to cop? How smooth or challenging was his progress from beat cop to detective? Why the specialty in undercover? (Perhaps Lone Wolf-syndrome? Trust issues? Remind you of anyone else we might know? Gayle H. is a contributor at wikiDeeks.com. 4 Comments on NCISLA Secret Agent Man – From Detective to Agent? Liz – Thanks for the positive feedback. Honestly I wrote this a year ago, so I’m not sure where to go at this point. Since there’s been virtually no mention and certainly no change in the status, all of the questions are still viable. Now I’m really wondering what’s keeping him LAPD. It doesn’t seem to offer him a benefit or a consequence to change right now. So what might force him? And end to the position? New requirements from either agency? Is LAPD his “safe haven”, someplace he can escape to if things get too bad at NCIS? (Maybe not that since he stayed post-torture.) Is he afraid he’ll get sent away like Kensi did? Something is going to have to force his hand. At that point hopefully it will be revealed what has kept him tied to LAPD/prevented him from committing to NCIS…. Or could it be as simple as the fact that he doesn’t work for the same organization as Kensi so if (I prefer to think “when”) they get together it wouldn’t be prohibited? I’d love for them to explore more of the Lawyer Deeks… actually I just want to know more about Deeks’ past in general. I am torn on whether I want Deeks to be a full agent or not. I would love the idea if he becomes a full agent for him to head to DC for training thus making a cross over with NCIS. I think Deeks and DiNozzo together would be HILARIOUS!! But I don’t want them to make him an agent just for the sake of making him an agent. He said once before that he was a cop through and through… it was part of his identity. While being an agent helps people on a grander scale he seems to be more of the type of person that wants to help the smaller scale people.